Have you ever wondered how an artist chooses a motif? It’s a pretty simple equation for this one. Personal memories and love for a subject, combined with the pure childlike joy of playing with paint. 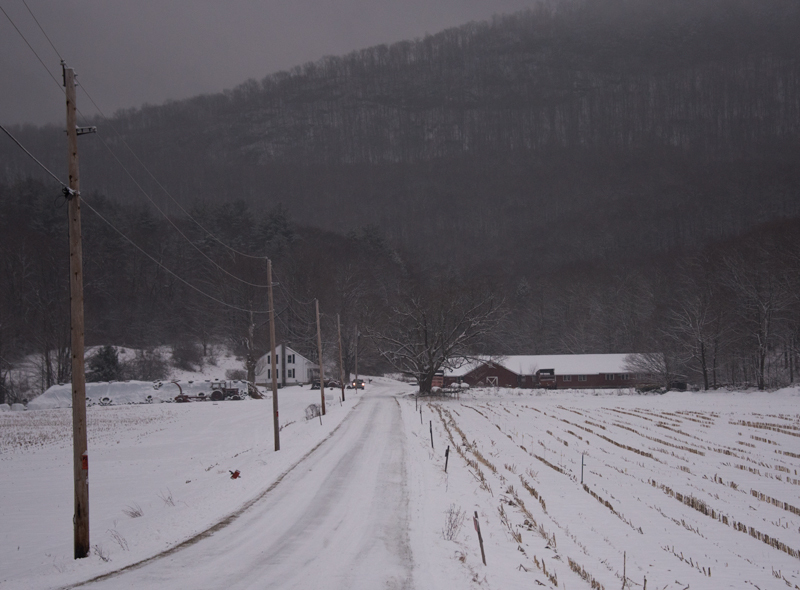 Some of the most vivid memories of my childhood growing up in Vermont were on Uncle Bob’s (Scott) farm in East Poultney. 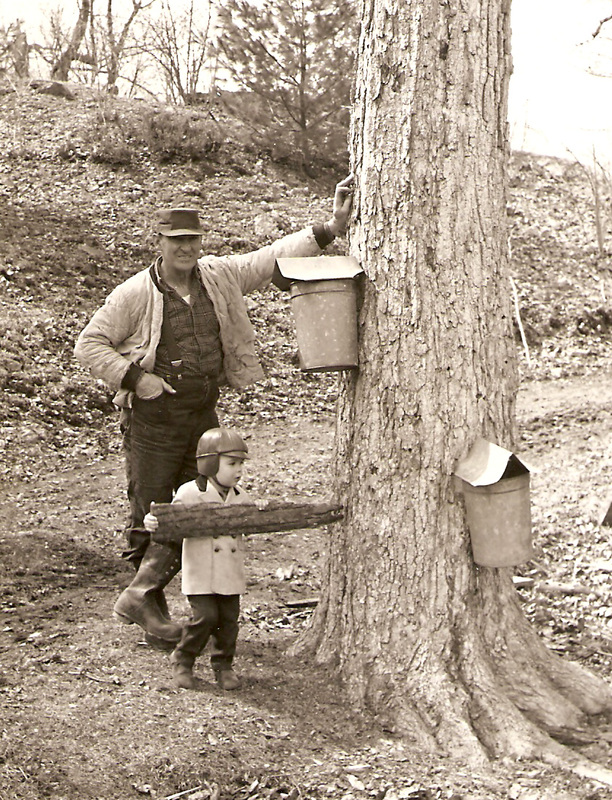 Here we are “tapping” a big maple during sugaring season, circa 1965. This is such a beautiful painting. It reminds me of time spent at my Grandmother, as a child, at her home in Bennington. I look forward to seeing your paintings every month. Thank you. Thank you Danielle! Oh, and a painting every week on Mondays. I love your little outfit in the “tapping” photo. Thanks, obviously my mom must have had a hand in that! Another wonderful painting. 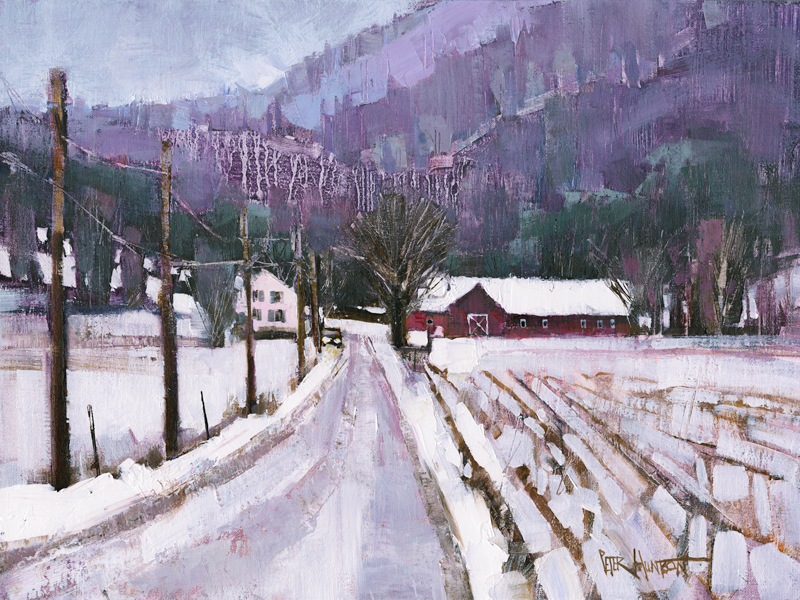 I too love the old VT farm scenes, love the mountains, the total feel of this painting! The painting is great, but I have to say, I’m with Suzi on the outfit. Man, a double breasted overcoat with two-tone collar/lapel! Bomber leather hat with the earflaps down! Stylin’! Funny Steve, yes, that was not standard issue Vermont farm attire, then or now. Your “part of the world” is so special! I lived in East Poultney in the 50’s and remember hearing of the Scotts. Went to HS there for two years. Thanks Judy, I’m PHS class of 1980. Most of us pine for simpler times of years gone by. But were they? Not sure. It’s all in the mind probably but those years of our childhood in the 1950/60’s were lovely, memorable simple times as far as I am concerned. That’s why I own and run an old-fashioned general store in a tiny Vermont hamlet. Presto: simple times are restored! Thanks Thomas, I’m not sure either but agree that they seemed that way. Where is your store? Sounds like a possible painting. Hi Thomas, congrats for your store. I am a child of the fifties in Germany. I have strong memories of this time. It was clearly structured and in the beginning our house was the second in our street. I remember also the general stores we had. It’s called in german “Tante-Emma-Laden”. But they nearly all vanished. Therefore I am really curious to see how Peter will paint your fine store. Now I remember Tom, I already painted your beautiful store in Tyson Vermont! Yes Peter, you did a wonderful rendering of my store completely unbeknownst to me until I discovered it on your website after the original had been sold. My regret is not discovering your work in time to purchase the original. I’ll certainly order and take a print of the store with me wherever I wander upon retirement. when I hang up my grocer’s apron for the last time. In the meantime, thank you for lovely renderings of this magical place we call home. Great memories indeed, thank you Cynthia! The photo of you and your uncle will make a wonderful painting. Hmmm…you never know. Thanks Stephanie! great maple tapping picture,should be your next watercolor. I’ll think on it Walter, thanks! Went to grade school in Poultney with a Bob Scott, maybe your cousin? My sister lives in East Poultney. Not sure Susan, probably a relation. My mother’s sister was Ella, who was married to the Bob Scott in the photo. It just reminds me of home. It’s so Vermot. Truly Vermont at its finest. Sorry for your loss Betty, and I hope you can visit one day! My mother was a Huntoon from Bradford, McKean County, Pa. Your beautiful paintings remind me of my years growing up in Bradford; a touch of home. You should auction a copy of the photo too! The painter in his youth!! Funny. That’s one of my favorite photos though. Thanks Mike! Such a wonderful memory. The painting is gorgeous! Still waiting for my name to be drawn! Thanks Joan, maybe one of these months your name will be drawn. With or without a free print, I really appreciate all your support! Love the violets and greens, like a catchers mitt embracing the primary focus at roads end. Now about the young Peter in the photo, what part of the Maple Sugaring process were you performing? Maybe I was testing the tree’s integrity, as my Uncle helped build mine. Thanks Chris! My memories of maple syrup making time looked more like your painting than like the priceless photo from your younger days. Snow stayed in the mountain area of Orange where I grew up well into spring My dad and I often scrambled through drifts and over snow banks to empty the buckets! Love the painting. Isn’t abstraction wonderful! All the variety of trees on the distant hillsides so apparent, but not a leaf or needle to be seen! Good memories indeed Brian. I recall some colder days, with lots of snow, as well. Mom must have stayed inside with the instamatic camera then. Hi Brian, it’s the freedom of painting which creates a form of extract. I love Peter’s winter landscapes. They are extracting the gloomy lights, these shades of lilac and grey and some highlights of color in the “white” sampled of different pastels. For me winter allows a fine and different spreading of colors. You are an inspiration to ME! I am a photographer. Creating art keeps us in the present moment even as the results can evoke nostalgia for times gone by. A loyal subscriber since almost the beginning. You have shown me lots of support Betsy, keep up the good work and thank you! Be time for that liquid gold soon enough! The photograph is so cool. Happy New Year Peter, all the Best. Thanks for sharing the photo. He is my uncle also. I have a lot of nice memories at the farm growing up. My mother was Rena. Enjoy your website and look forward every Monday to see what you have been painting. Hi Peter, winter in Vermont must be a attractive for you. You always find a motive and a way to express the moods and the colors fitting to the motive. The photo is nice and charming too.